The UK government is seeking buyers for its 40% stake in the cross-Channel train operator Eurostar to help boost the public finances. The intention to sell was set out last year in the government's Autumn Statement and National Infrastructure Plan. Under the plan the government hopes to raise about £20bn from corporate and financial asset sales by 2020. 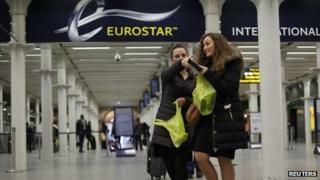 The RMT union and the Labour Party have voiced concerns about selling Eurostar. Chancellor George Osborne said on Monday: "I am determined that we go on making the decisions to reform the British economy and tackle our debts. So we will proceed with the potential sale of the UK's shareholding in Eurostar today. "Ensuring that we can deliver the best quality infrastructure for Britain and the best value for money for the taxpayer are key parts of our long-term economic plan." Mr Osborne added: "As part of our aim to achieve £20bn from assets sales by 2020, the sale proceeds would make an important contribution to the task of reducing the public sector debt." But Mick Cash, general secretary of the RMT rail union, said the Eurostar sale could see more of the UK's railways in foreign hands. "This compounds the issue of foreign ownership of Britain's railways as the French state has first refusal on our slice of the highly profitable Eurostar cake. The French and Belgians think we are insane knocking off such a valuable and strategic infrastructure asset," he said. Mary Creagh MP, Labour's shadow transport secretary, said: "The National Audit Office should urgently conduct a value-for-money enquiry before this sale proceeds. "We must ensure that taxpayers are not ripped off again by bungling ministers and poor financial advice from the City," she said. The government said it expects to reach "definitive agreements" in the first quarter of 2015. Eurostar began service in 1994 as a partnership between three railway companies: SNCF, SNCB and British Rail (subsequently LCR). Since then, Eurostar has carried more than 145 million passengers, with more than 10 million in 2013 alone. Numbers have risen every year for the past 10. In June this year the UK government's holding transferred from LCR to the Treasury. Other possible asset sales include the government's stake in the uranium enrichment company URENCO, legacy Royal Mail pension assets and the government's student loan book. The Treasury has decided against selling off the Royal Mint, principally because it would not raise enough money. Ahmed: Eurostar sale last pre-poll?